Every time I make chicken thighs I think to myself, “I should buy these more often.” They’re a great cut of meat because they’re inexpensive (I got mine on sale for .89 per pound), they have a ton of meat on them and they’re tender and full of flavor. 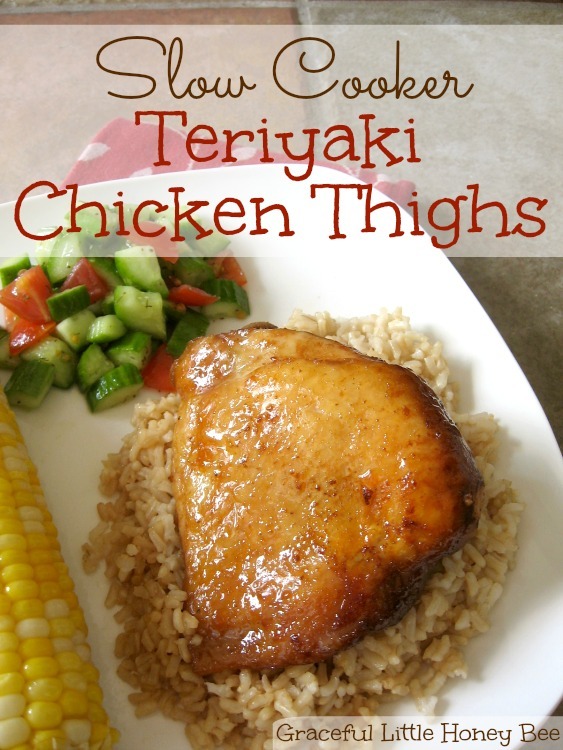 Chicken thighs really are a frugal girl’s best friend. Also, I love using my slow cooker in the summertime because it lets me get dinner on the table without heating the house up. This recipe is great because it’s easy and will make your house smell awesome. You could even make up a few extra batches and put them in the freezer for busy nights. Tip: If serving shredded, drizzle the marinade over the chicken before serving for more flavor. 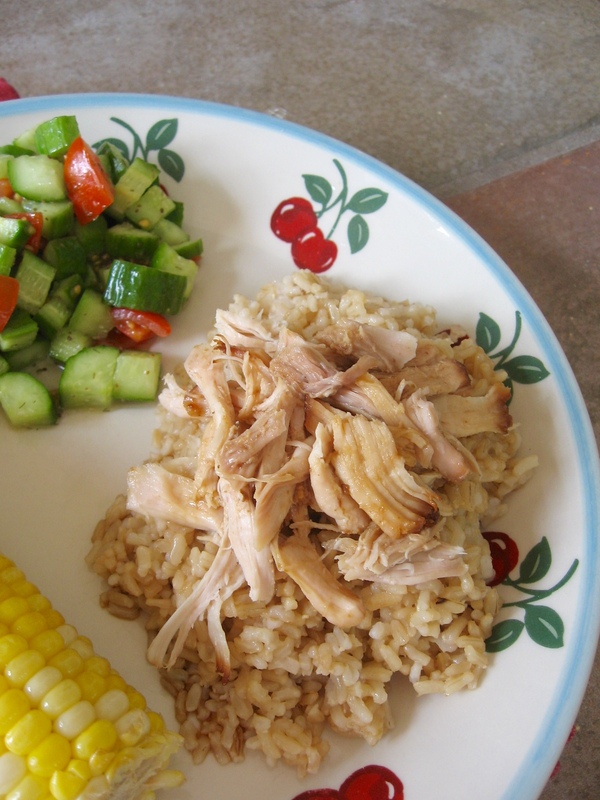 Place thawed chicken thighs in slow cooker. In separate bowl, mix remaining ingredients. Pour mixture over chicken thighs. Serve whole or shredded over rice. 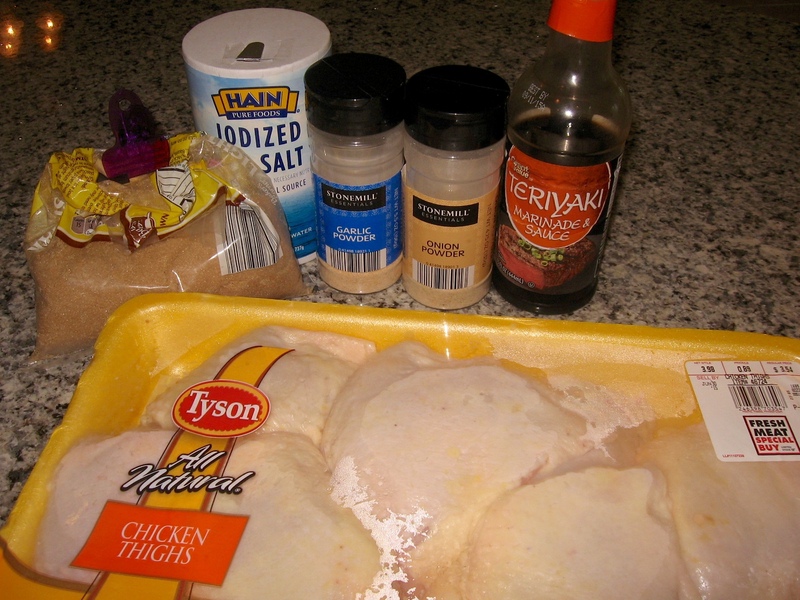 If serving shredded, drizzle the marinade over the chicken before serving for more flavor. So you leave the skin on when putting in the pot? Doesn't the skin get rubbery? I leave the skin on, but then remove it before eating so I'm not sure about it being rubbery or not. These look tasty. How would you freeze them? I buy chicken thighs in 8 packs and freeze them before cooking. If you want to cook them fresh you could then shred the meat and freeze it that way. I'm sure you could adapt it to work on the stove or in the oven easily. Save even more money and avoid the preservatives in bottled teriyaki sauce by making your own: 2 cloves minced garlic 1 Tablespoon minced FRESH ginger <---key ingredient unless you hate it) 2 Tablespoons olive oil Saute in saucepan for a couple minutes, then add: 1/2 C soy sauce (low sodium) 1/2 C water 2/3 C brown sugar bring to a low boil and then simmer for a few minutes. You can thicken it with cornstarch (2Tbs cornstarch and 2 Tbs water mix and pour in sauce). That's all there is to it. Goodmorning! My packet of meat comes in a total of 8 thighs do I double the ingredients? I don't think doubling is necessary since the thighs will release their own juices. I have a package of 8 thighs.. do I double the ingredients? I wouldn't worry about doubling. The legs will release juices as they cook so it should be fine, but you can try it if you want too. Making your own teriyaki sauce is super easy. Lots of recipes online.